Senate Iran disapproval measure fails: Republicans couldn't reach 60-vote threshold to reach final vote. 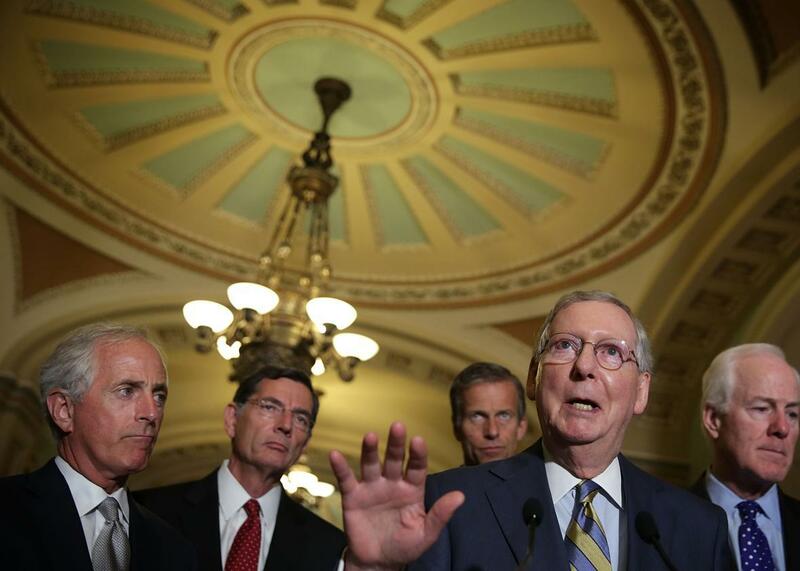 U.S. Senate Majority Leader Sen. Mitch McConnell (R-KY) speaks to members of the media as (L-R) Sen. Bob Corker (R-TN), Sen. John Barrasso (R-WY), Sen. John Thune (R-SD), and Senate Majority Whip Sen. John Cornyn (R-TX) listen after the weekly Senate Republican Policy Luncheon Sept. 9, 2015. After the Senate vote Thursday, the House passed a resolution on a straight party vote stating that the President failed to comply with the law on the Iran nuclear deal because he didn’t provide Congress with details on so-called “side deals” governing inspections of possible nuclear sites. The non-binding measure was approved 246-186 and could lay the groundwork for a future legal challenge against the Obama Administration. For nearly two years, we negotiated from a position of strength to reach an agreement that meets our core objectives. Since we concluded these negotiations, we have had the most consequential national security debate since the decision to invade Iraq more than a decade ago. Over the last several weeks, the more members studied the details of this deal, the more they came out in support. Today, I am heartened that so many Senators judged this deal on the merits, and am gratified by the strong support of lawmakers and citizens alike. History will remember your vote and only your vote. It will remember that you opened the gate to Iran’s path to a nuclear weapon. It will remember you as the ones who flipped the strategic balance of the Middle East and the world toward the favor of our enemies. And it will remember you, this Senate, and this president as the ones who — when given the chance to stop the world’s worst sponsor of terrorism from obtaining the world’s worst weapons—blinked when confronted with that evil. The Associated Press reports that the Obama administration could begin easing sanctions on Iran under the terms of the agreement as early as next week, though taking any action on that front is sure to bring a firestorm of criticism and demands that any changes wait until all possible legislative and legal challenges have been exhausted. There will no doubt be more strongly-worded resolutions to vote on and maybe some lawsuits assembled in the coming weeks, but the first major congressional battle over the Iran nuclear agreement was settled in President Obama’s favor on Thursday.